I have an appointment at a local hospital. I scan the waiting-room. Another notice. Leadership – we believe in leadership at all levels…. It seems every organisation needs to have a list of “values” these days. It’s not enough for a company to issue a catalogue listing out the goods it sells and their prices. It’s not enough for a dentist to provide a list of the services it offers and what appointments are available. It’s not enough for the police force to tell us what number to phone in an emergency. 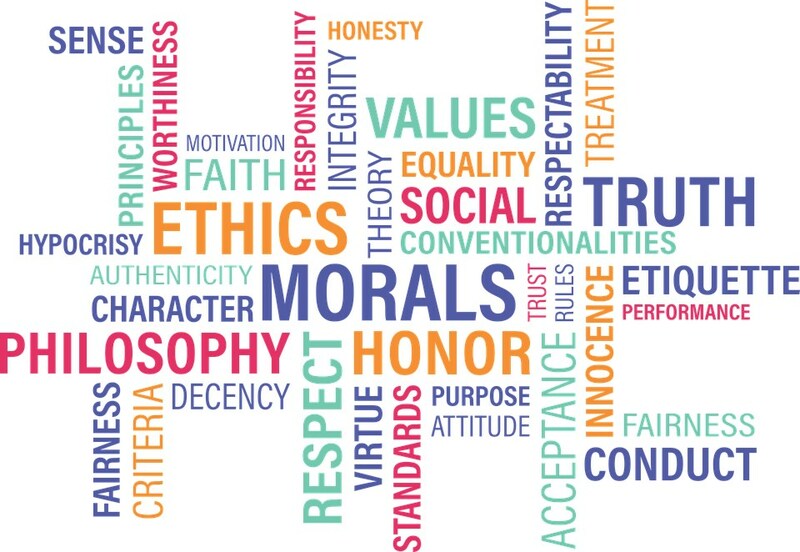 We need to know what “values” every organisation holds (in the case of the GMP they are Courage – Support – Justice- Integrity – Compassion – Openness – Responsibility). Values – but are they valuable? When did all this begin? I’m not sure. Did organisations always feel they needed to spell out their values in this way? I find it hard to believe that they did. And do such lists of values mean anything? Most of them seem pretty bland (apple-pie and motherhood). Is there any school in the country that wouldn’t claim to be “striving for the highest professional standards”? Is there any hospital that would say, “we don’t value excellence. We’re not dedicated to being the best we can be?” (It’s a bit like a restaurant with a notice outside: “Good Food”. Well they would say that, wouldn’t they? I’ve not seen one yet that advertised “Bad Food”). So perhaps we should ask ourselves “what are our values? What are the values that underlie the life of this church? Or more exactly what are the distinctive values of this church? What are those intangible ideals and convictions which other churches may not hold but which we think are important? I’m not asking “what doctrines do we believe?” If you want a list of those, you can go to the church’s statement of faith or if you want a fuller list, to the 1689 Confession or 1966 Affirmation. Those documents lay out clearly the truths that we believe and teach: the doctrines of the Trinity, the Authority of Scripture, the Plan of Salvation, the Person and Work of Christ, Repentance, Faith, Baptism, and so on. Nor am I asking, “what activities do we run?” You’ll soon find them out if you read this bulletin every month: our Sunday services, our Bible studies, our prayer-meetings, our outreach to children, to teenagers, to the elderly. Nor am I asking, “How do we operate? What are our rules? How are things organised?” Those things are detailed in our constitution. Nor finally am I asking, “What do we expect from our members? What are their duties?” Those things are made clear in our covenant of membership. No, I’m asking a more difficult question. What colours our church life? What gives it its distinctive flavour? What are the convictions which underlie everything we do? In short, what are our values? I don’t mean we’re grim, grey, dour. I hope we’re not. We can laugh, we can joke, we can tease the children and one another. But when it comes to the great tasks of the church, we take things very seriously. The church – any true church – has two great tasks. The first is to worship God. We aim to do that in all our meetings – we sing his praises; we listen to his words given to us in Scripture; we speak to him in praise and prayer. And we do it reverently. We’re aware that we are tiny creatures approaching the infinitely great God. We’re aware that we are corrupt creatures approaching the perfectly holy God. We’re aware that the Lord Jesus has paid a terrible price to make it possible for us to come before God. So we come with awe and wonder. Isn’t this how the Bible says worship should be? “Worship the LORD in the splendour of his holiness; tremble before him all the earth!” (Psalm 96:9). “This is the one to whom I will look: he who is humble and contrite in spirit and trembles at my word” (Isaiah 66:2). Yes, those are Old Testament texts. But New Testament worship is no different “Let us offer to God acceptable worship, with reverence and awe, for our God is a consuming fire…” (Hebrews 12:28). If we want to know how the New Testament church should worship, we can look into heaven and see the glorified saints in the presence of God: “the twenty-four elders fall down before him who is seated on the throne, and worship him who lives for ever and ever. They cast their crowns before the throne, saying, ‘Worthy are you, our Lord and God, to receive glory and honour and power, for you created all things, and by your will they existed and were created…” (Revelation 4:9-11). Read the Bible from one end to the other and you will find countless examples of people meeting with God and worshipping him. Some sang joyfully in God’s presence, some wept tears of repentance, some were simply overwhelmed and stunned into silence. But no-one came casually, cheerfully, grinning, whistling or giggling. No-one thought they could play games in God’s presence, or have a fun time. Young or old, sinner or saint, those who sought God were serious. There are many churches today that have decided, quite deliberately, that their meetings should be as casual, as laid-back, as easy and undemanding as possible. They want to make worship fun. (If they were to list their values, “fun” would be high on the list). So the children have Messy Church. The teenagers have Rock Band Church. The middle-aged have Stand-up-comedian Church. The elderly have Songs-of-Praise Church. And they all come together at Christmas for Toy-service-complete-with-Santa-Church. Well, if those are their values, they must be true to them. But we’re not planning to go down that road. Because for us, to worship the living God will always be the most overwhelming, the most awesome, the most demanding, the most holy work in the world. It is the church’s first task. And the church’s second task? To preach the gospel. To proclaim God’s message to the world, and thus to make disciples, baptising them in the name of the Father, the Son, the Holy Spirit, and teaching them to observe all Jesus’s commands (Matthew 28:19-20). Again, some Christians have decided that preaching the gospel can be done in a fun way. Comedy routines, puppet shows, mimes, skits, solos, entertainments of all sorts. Anything that will make people smile and feel good. And nothing too serious. But that’s not our way. If we’re preaching the New Testament gospel, we have to be serious. Which bit of the gospel is entertaining? The fact that all have sinned and face wrath, fury, tribulation and distress (Romans 2:8-9, 3:23)? The declaration that God’s Son bore our sins in his own body on the tree (1 Peter 2:24)? The call to turn from idols and serve the living and true God and to wait for his Son from heaven, whom he raised from the dead, Jesus who saves us from the wrath to come? (1 Thessalonians 1:9-10). Which part of the gospel is cute, cool, funny or cosy? How did Paul and the other apostles preach the gospel? “I did not shrink from declaring to you anything that was profitable, and teaching you in public and from house to house, testifying both to Jews and to Greeks of repentance toward God and of faith in our Lord Jesus Christ… I am innocent of the blood of all, for I did not shrink from declaring to you the whole counsel of God… Therefore be alert, remembering that for three years I did not cease night or day to admonish every one with tears” (Acts 20: 20-31). “We are ambassadors for Christ, God making his appeal through us. We implore you on behalf of Christ, be reconciled to God. For our sake he made him to be sin who knew no sin, so that in him we might become the righteousness of God” (2 Corinthians 5:20-21). Nothing casual or jokey there. Different preachers will have different styles. But I believe that anyone who has grasped the awesome issues that are at stake when we proclaim the gospel will be serious. I’ve described the way that many churches choose to worship and to witness – their attempt to make everything easy, fun, entertaining. Why have they chosen to go down that road? Well, I guess their answer would be in many cases, because it works. Churches that use those methods attract people. They draw the crowds. People are persuaded to become Christians. Folk enjoy being there and they get involved. It’s all about making use of natural factors. Every normal organisation looks for strategies and methods that will lead naturally to success. Supermarkets have found that customers will spend longer in the shop and buy more if there’s pleasant music over the PA system. Schools have found that their exam results improve if students are made to wear smart uniforms. Political parties have found that they get more votes if their leaders are young, photogenic and have a sound-bite for every occasion. All of these organisations would be foolish if they didn’t take advantage of such natural tendencies. And the argument is that churches must do the same. They must be prepared to harness the natural psychological and social forces that govern human behaviour. Suitable music can soften people up so that they’re more ready to make momentous decisions. So play lots of music to them before inviting them to turn to Christ. People are more relaxed if they’re with other people of their own sort. So get people together in groups where everyone is of similar age and background. People don’t want to be put in situations where they’re visible and can be identified and held to account. So structure churches in such way that people can come and go without ever having to relate to anyone. Well, we haven’t done that. In fact, when it comes to the work of the church – the great tasks I’ve talked about – we’ve often done things in ways that seem to make “success” less likely. It’s not hard to think of examples. We’ve insisted that the Lord’s table is only for believers who are members of gospel churches and who are known to us. The result has been predictable – lots of people have gone away offended because they weren’t allowed to “take communion”. We’ve aimed to preach consecutively through whole books of the Bible, even though we’ve realised that many people will think that sermons on Leviticus or 2 Corinthians are irrelevant to them and will go away bored. We sing but we do it without the help of a choir, without elaborate accompaniments, without a constant turnover of new melodies. We preach the gospel but we choose to do it without any of the entertaining sideshows that others tell us are necessary. Why? Because we’re trying to follow the Bible. And the Bible writers always take it for granted that the Lord’s Supper is for believers who have been added to the local church. It seems obvious that Bible books are designed to be read through from beginning to end, not cherry-picked for the nice bits. I’ve tried to show already, there’s no suggestion in the Bible that we should ever try to make the gospel entertaining. And the New Testament never encourages us to use elaborate music – it just tells us to sing. So yes, we’re conscious that the methods we use are likely by any natural human calculation to be ineffective. What are our methods? We talk to people and explain to them publicly and privately what the Bible says – even though naturally speaking people today aren’t interested in the Bible and aren’t used to listening to serious discourse. We worship God in the simplest possible way even though it may seem completely unexciting to people brought up on TV razzmatazz. We aim to befriend people, even though we live in an individualistic society where overtures of friendship are often misunderstood. We refuse to compromise our moral standards even though it leaves many people convinced that we’re bigoted, old-fashioned and hopelessly boring. We pray even though people sneer at the idea that prayer can change anything. How can we hope to achieve anything with such primitive, feeble, ineffective tools? How can we hope to compete in the modern, hi-tech, media-savvy, culturally-diverse, entertainment-obsessed, up-to-the-moment global society if we’re not prepared to use any tools except talking about the Bible, worshipping God, befriending people, living godly lives, praying? Answer. 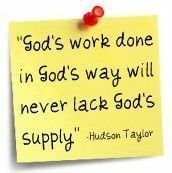 We believe that God’s work is not done by natural means. We believe it’s done by the supernatural power of the Holy Spirit. “Not my might, nor by power but by my Spirit says the LORD” (Zechariah 4:5). “When I came to you brothers, I did not come proclaiming to you the testimony of God with lofty speech or wisdom. For I decided to know nothing among you except Jesus Christ and him crucified. And I was with you in weakness and in fear and in much trembling, and my speech and my message were not in plausible words of wisdom, but in demonstration of the Spirit and of power, that your faith might not rest in the wisdom of men but in the power of God” (1 Corinthians 2:1-5). David was wise enough to understand that natural strength would achieve nothing. Saul urged him to put on a suit of armour for his battle against Goliath. But David knew that it would only hinder him. He discarded that natural resource and went out against the giant armed only with the tools of a shepherd – and the knowledge that God was with him. “David said to the Philistine, ‘You come to me with a sword and with a spear and with a javelin, but I come to you in the name of the LORD of hosts…This day the LORD will deliver you into my hands” (1Samuel 17:45-46). The Bible gives us these grand examples of men who were ready to do without all natural resources or methods and to depend on God’s supernatural power alone. But the Bible also gives us many examples of situations where God’s people made the mistake of adopting natural methods in order to gain success – and discovering that they had grieved God. Isn’t that the lesson we’ve been learning from Ezekiel on recent Sunday evenings? The Israelites thought they needed the natural help that Egypt could give – her military power, her wealth, her clout on the world stage. But Egypt was a broken staff. What Israel needed was not more natural resources. She needed more of God’s supernatural power. Our conviction is that God’s work should be done in God’s way depending on God’s power alone. Yes, a church – like any organisation – might achieve some outward “success” by adopting the methods of the world, depending on natural powers and resources. But such success isn’t worth having. God is only glorified when his people do things his way depending on his invisible power. We depend on the supernatural. And that conviction must shape the whole life of the church. We are an independent church. We’re not affiliated to any denomination, any movement, any grouping. We are simply ourselves – an assembly of God’s people, reading the Bible together, learning from it, aiming to do what Jesus Christ our Master wants us to do. That doesn’t mean we’re isolationist or know-all. We’re willing to listen to anyone who accepts the authority of the Bible; we’re willing to learn from anyone who can cast light upon it. We value the great Christian writers of the past; we’re grateful for the great creeds and confessions (especially the 1689 and 1966); we’re glad that there are many gifted preachers and teachers in our day and we’re glad to learn from them. But we don’t believe anything just because some Christian leader says it’s true. And we don’t do anything because it’s the norm for a particular movement or group. We simply do what we think the Bible teaches us to do, and what seems natural to us. Other Christians seem to find that hard to understand. I’m often questioned by people who want to know where we fit on the ecclesiastical map. I tell them that we’re independent. I tell them that we preach the great doctrines of the Reformation and that we practise believers’ baptism. But that doesn’t satisfy them. They want to know what grouping we belong to. Which network are we linked with? Who are the men we look to for teaching? Are we a “Lloyd-Jones church”? Are we a “Met Tab church?” Are we a “Nine Marks” church? Do we look to John Piper or John Macarthur as our guide to understanding the Bible and Christian doctrine? They don’t seem to believe that we can just be ourselves. Nor can they believe that we can do things just because they seem natural to us. They look at the way we do things and assume that we must be doing them that way because it’s expected of us in our grouping (whatever that is). However often I deny it, they are sure that we must be following a set of rules or traditions laid down for us by somebody somewhere. Well, why do we have chairs in rows in Sunday services? Because that’s traditional in reformed churches? No, if we thought another arrangement would work better, we’d adopt it. We have experimented with other arrangements. But people didn’t find them helpful. So we stuck with our rows. It was simply the best way for us. Why do we sit in a circle round the Lord’s table? Because that’s traditional in Brethren assemblies? No, none of us come from that background. We do it seems the obvious thing to do when you’re sharing a meal together. Why do I wear a tie on a Sunday but not in a Wednesday evening meeting? Because it’s expected of pastors “in our circles”? No. Just because, given my upbringing and personality, I’m comfortable with that. Why do we have three hymns in most services? Is it a rule that someone’s imposed on us? No, it just seems a good idea to have one hymn to begin the worship, one to prepare us for the preaching and one to express our response at the end. And if on any occasion we think it would be better to have one or a dozen or none, then we’re free to do that instead. Why do we have a men’s prayer meeting on a Friday morning? Is that a tradition among reformed baptist churches? No, I can’t think of another church that does it. But some of us are free at that time, so why not? I honestly can’t think of a single thing that we do as a church because it’s expected of us by other Christians or because it’s the norm in particular Christian circles. If it’s something that we can see clearly commanded in the Bible, we do it for that reason. If it’s not, then it wouldn’t matter what anybody else thought: we would feel free to discard it if we didn’t find it helpful. Jesus gave his disciples this command: “You are not to be called rabbi, for you have one teacher, and you are all brothers. And call no man your father on earth, for you have one Father, who is in heaven. Neither be called instructors, for you have one instructor, the Christ” (Matthew 23:8-10). He wasn’t saying that there are to be no leaders or teachers in his Church. But he was saying that we should never set up any man as our Guru to be believed and followed implicitly. We have one Master – Christ himself – and we are ready to follow wherever he leads. In the end, it doesn’t matter what’s normal, traditional or fashionable among other churches or in any grouping of churches. We’re answerable to our one Master and to him alone. He’s given us his Word and he’s given us freedom to be ourselves. “For freedom Christ has set us free. Stand firm therefore and do not submit again to a yoke of slavery” (Galatians 5:1). The church must be serious. The church must be supernatural. The church must be free. I hope you recognise those three “values”. I hope you can see them undergirding the life of the church. Now all we have to do is live by them. May God help us to work them out more and more consistently in the days ahead.